Major retailers, pharmaceutical and many other business use these displays to advertise offers, advice or direction. Using a combination of strutted cards to coincide with your business activities is another tool in your printed marketing box. Printed on 170gsm gloss art and mounted on to 2mm white screen board. Cardboard strut attached on back. Talk about eye catching retail, instore displays – the strutted counter card isn’t easily missed when placed strategically on or near the cash register, item on sale or products being demonstrated. 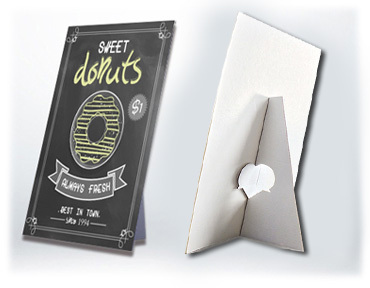 Point of sale strutted cards are rigid but lightweight. The cardboard strut folds down easily for transport. It’s a good marketing and value add tool for last minute or impulse purchases. We print our counter cards on good quality 170gsm gloss art paper and laminated on to a rigid 2mm screen board. The foldout cardboard strut is glued on to the back. Choose from gloss or matt lamination to highlight your design. For high traffic areas, the lamination on your counter cards will make them look great and last a lot longer. Typical sizes for Strutted Cards are A5, A4, A3. Custom and larger sizes also available. 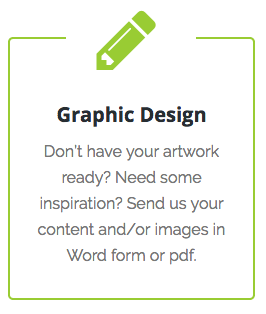 Turnaround time is usually within 5-7 business days. We deliver anywhere in Australia.